I managed to get a really good drive with the new car over nearly 300 miles in many different driving conditions. My first leg of the journey was on a fast A road, the weather was clear but the road was slightly damp from rain overnight. Nevertheless I managed to get feel for the car during brisk driving. I have driven an F430 a couple of times before and my test drive of this car reinforced my initial impressions, the car wasn’t that much faster than the 360. Maybe as a die hard 360 owner I was biased after all the 360 is a better looking car and if it was nearly as fast as the F430 then why bother to upgrade? The first part of my drive yesterday blew this out of the water – the F430 is a seriously quick car and you can tell the difference over a 360. My misconception may have been because in my previous drives I had the owner sitting next to me. Well now I’m the owner and after I had time to get a feel for the car and start to push on it just got better and better (read faster and faster!). I can’t wait to get the car onto a dry track and really see what it can do. The next part of my journey was a long motorway drive in heavy rain. I chose not to push on and joined the general flow of traffic at normal speeds and even turned the radio on. After a short while I actually forgot that I was in a Ferrari, it felt like any other motorway journey that I had done many times before. This car is a lot more refined than the 360. It’s hard to put my finger on specifics but the overall package is a lot more comfortable. There’s no way I’d be able to forget that I was driving a 360 no matter what was on the radio! Once I got to London I hit heavy traffic and the F1 box was just as much as a nightmare as the 360. Having said that the gear change in normal driving conditions makes the 360 F1 system seem like it was developed in the stone age. Take off from standstill is much improved – a bit of throttle and the clutch is fed in beautifully. Normal gear changes are good but when the hammer is down they feel almost seamless. I’m told that as mine is an early car the later software revisions are even better. I can believe it too – I recently had opportunity to drive a 599 on road and on track and the F1 system on that was simply awesome. Other little improvements that I appreciated included the temperature dials in Celsius. I’m young enough to have been educated in Metric so it’s nice not to have to convert the dials into new money all the time! Congrats Aldous …myself, also contemplating a 430 ! Nice buy Aldous. I may aspire to a 430 one day abut as I’m almost seventy that probably not happen. I have a 99 360 and recently changed the TCU to one flashed with the CS firmware and I must say it’s a big improvement. Not as good as a double clutch system that I tried in a loaner Porsche Cayman but with gear changes at 5000 RPM the transition is almost seamless. Brilliant write up Aldous, thankyou for sharing. I have been considering a F430 for around 6 months now (Currently have F1 360) and I have been toying with getting one alongside the 360 purely because I think I would miss the 360 as I love the car so much and feel I would be gutted if I got rid of it. 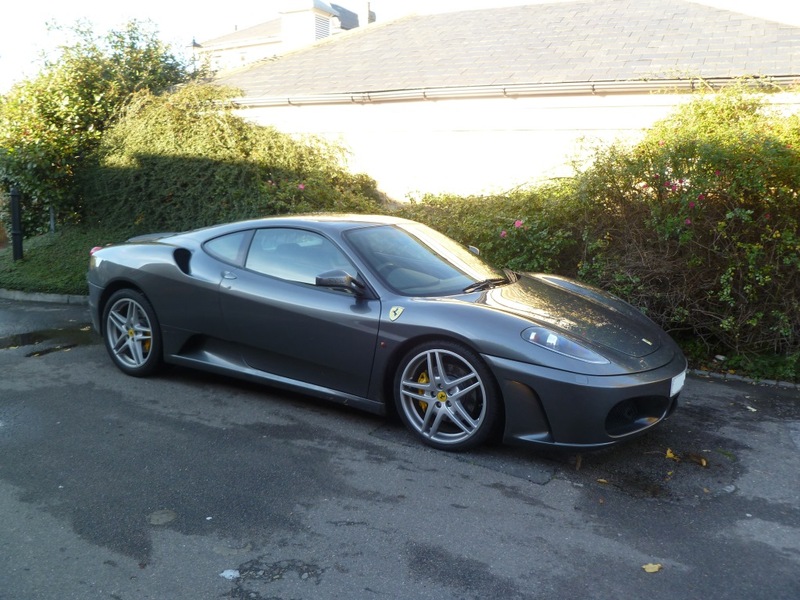 I had similar thoughts about the F430 as you – not much quicker, also very similar in looks (even has the same chassis) but after reading your review and knowing the journey you have had 360>430, maybe my thoughts aren’t as justified as I originally thought ? I do miss the 360 and quite a large part of me is sad not to be embarking on a new 360 project. I had so much planned for my next car and now that’s all gone. However, I’m a real convert to the 430 (apart from the rear lights which I still think look gash). The comment about forgetting I was driving a Ferrari was genuine, I really did forget for a moment. I included it as it served to illustrate the increased level of refinement over older cars. Don’t get me wrong, when I was properly driving the car I knew what marque I was in! I am confused about which model to get …360 Modena or F430 coupe aargh. Glad you have got back into a Ferrari, our old car is a sad sight, be interesting to see the repair process and her back on the road again. Enjoy your 430 in good health. Thanks Neil – yes our old car is a sight for sore eyes but I’m confident the new owners will bring her back to rude health!